This Website is dedicated to providing the latest information on BACnet - A Data Communication Protocol for Building Automation and Control Networks. Developed under the auspices of the American Society of Heating, Refrigerating and Air-Conditioning Engineers (ASHRAE), BACnet is an American national standard, a European standard, a national standard in more than 30 countries, and an ISO global standard. The protocol is supported and maintained by ASHRAE Standing Standard Project Committee 135 whose members have created and provided the content for this Website. Here you will find the latest BACnet news, the status of SSPC 135 activities, a comprehensive bibliography of BACnet publications - many of which are available on-line - along with a wealth of other information. In keeping with ASHRAE's long-standing tradition and policy of non-commercialism, this site contains no advertising. However, BACnet's success depends on the implementation of BACnet in commercial products. Thus, we are pleased to offer links to the Websites of manufacturers who are supporting BACnet through their product offerings. The SSPC welcomes your comments and suggestions concerning this site! Two Addenda Go Out for Public Review! (3/19) Atlanta, GA. This proposed addendum is undergoing a 30-day 2nd Publication Public Review from March 29 to April 28, 2019: Addendum 135-2016bw. There is a need for a simple, universal data exchange format for the transfer of time-series data between various platforms for operations such as analyzing the energy performance of buildings. This addendum adds a Time Series Data Exchange Format. This proposed addendum is undergoing a 45-day 1st Publication Public Review from March 29 to May 13, 2019: Addendum 135-2016bx. This addendum adds Device Address Proxy functions, i.e., describes a mechanism by which a BACnet router can perform I-Am request proxying for any directly connected BACnet network. SSPC to Meet Again in Fort Lauderdale! (3/19) Victoria, BC, Canada. The spring interim meeting of SSPC 135 will once again be hosted by Lutron in Plantation, Florida, a suburb of Fort Lauderdale. To view the meeting information, please click here! BIG-EU Sponsors First Two-Day BACnet Academy! (2/19) Dortmund, Germany. Designing and operating buildings more efficiently will be the focus of BIG-EU's first two-day BACnet Academy. Here is an excerpt from the press release announcing the seminar. "The BACnet Interest Group - Europe (BIG-EU) will be holding its first two-day BACnet Academy in Stockholm, Sweden, on April 24-25. The event will feature the basics of interoperability as well as innovations from the world of networked building technology. The Academy will support building planners, system integrators, project engineers and facility managers with an intensive and up-to-date overview of possible applications. 'With the many innovations concerning BACnet, smart buildings can be operated even more efficiently,' explains Frank Schubert, spokesman for the BIG-EU Advisory Board, who is also the instructor at the Academy in Stockholm. He will provide participants with first-hand information on the integration of lighting, security and elevator technology; on the integration of cloud computing; on the new BACnet/Secure Connect technology [BACnet/SC]; as well as the worldwide certification system for BACnet products. Academy participants will be awarded a certificate and additional information and registration may be found at www.bacnetacademy.org." BIG-EU Again Hosts BACnet Booth at ISH! (2/19) Dortmund, Germany. 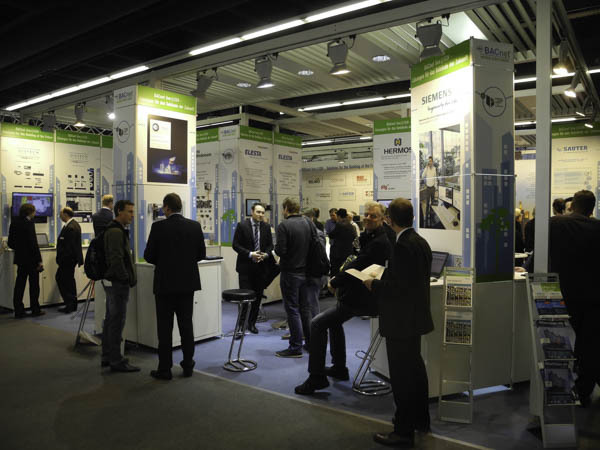 ISH ("Internationale Sanitär- und Heizungsmesse"), the International Plumbing and Heating Show, is held every two years in Frankfurt am Main. It is one of Europe's largest trade shows with nearly 200,000 visitors and more than 2,400 exhibitors from all over the world. The BACnet exhibition will be hosted, once again, by the BACnet Interest Group - Europe and will be located at Stand A61 in Hall 10.3. Here is an excerpt from BIG-EU's press release. "Under the slogan "BACnet® – Most Successful Standard in Building Automation" European suppliers will present new solutions for interoperable building systems. The companies to be represented include ABB, ALRE-IT Regeltechnik, Bihl + Wiedemann, Danfoss, J2 Innovations, Johnson Controls, Oppermann Regelgeräte, SAUTER, SE-Elektronic, Tridium, TÜV SÜD and numerous logo exhibitors. The joint stand will provide planners, integrators and users such as the airports, the Deutsche Bundesbank, the Austrian Armed Forces and public administrators with the ideal location to exchange technical information. The investors and constructors of multi-purpose urban buildings and indoor mobility will be invited to other special events at ISH in Frankfurt. In view of the upcoming "BACnet Indoor Mobility Conference" from 26–27 September 2019 – also in Frankfurt – they will be informed about the new possibilities of BACnet. According to the latest BSRIA study [the UK's "Building Services Research and Information Association"], the BACnet communication standard has reached a global market coverage of 64%. Analysts expect further growth in the next five years. BACnet offers the platform to become the leading IoT standard with the possibility of combining all applications into one network. With indoor mobility, elevators and escalators, it opens up new application areas and offers the implementation of communication in cloud systems." Atlanta Meeting Wrap-up! (1/19) Atlanta, GA. Here is a summary of the highlights of the SSPC meeting that took place in January in the shadow of Mercedes Benz arena, the site of this year's Superbowl! Thanks to SSPC Secretary Scott Ziegenfus, Hubbell Lighting, for this report. An interpretation was made of whether the Multi-state Input Out_Of_Service Property being TRUE means its fault algorithm would not be evaluated. This was found to be incorrect and that the fault algorithm continues to be evaluated when the Out_of_service property is TRUE. New elevator application specific BIBBs are added. These new BIBBS are based on the existing or extended common BIBBs, exclude some requirements not relevant for elevator applications, and add specific requirements that are relevant for elevator applications. New elevator device profiles are added in new device profile families for elevator devices. It was agreed to add a simple, universal data exchange format for the transfer of time series data between various platforms for operations such as analyzing the energy performance of buildings. This format is designed for export from databases in servers or workstation-class computers with user interfaces. It is not intended to replace the BACnet ReadRange service in devices or the queryable history services provided by BACnet Web Services. This addendum is working towards minimizing the traffic on large networks resulting from broadcast Who-Is requests and I-Am responses by adding a device address proxy table inside of the router. The router still discovers and re-discovers each device on its networks and updates its proxy table. Who-Is requests going to a proxy network will be responded to with an I-Am request by the router just as if a packet had been generated by the device being sought. In BACnet International news, Emily Hayes will be the new BTL Manager and Rich Ruel will assume the newly created position of Technical Services Manager. Former SSPC chairman Carl Neilson will become a BTL Technical Advisor to assist Emily with BTL related initiatives and issues. BACnet International has a new on-line course for Facility Managers called "Facility Manager's Guide to Building Automation". Copass Celebrates Pending Retirement! (10/18) Atlanta, GA. 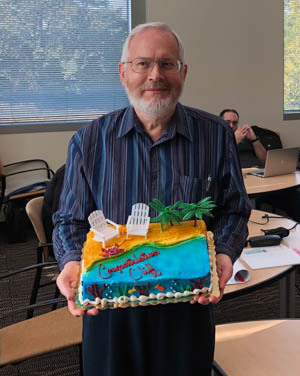 Surrounded by the BACnet committee, Cliff Copass, Johnson Controls, was presented a festive cake to commemorate his upcoming retirement and his many years of dedicated participation and contributions to the BACnet standard. As near as Cliff or any of us can recall, he has been actively working with BACnet since 2000, 18 years, more or less. If all goes as planned, this may be his last meeting and, come January when the committee is once again in Atlanta, Cliff and his wife will be basking in the sun (as indicated by the arm chairs and palm trees on the cake) in sunny Wisconsin - or maybe Florida. In any case, congratulations Cliff! Enjoy! SSPC Meets in Atlanta! (10/18) Atlanta, GA. For information on the fall SSPC meeting at Georgia Tech, please click here. Three More Addenda Go Out for Public Review! (8/18) Atlanta, GA. These three proposed addenda are undergoing a 45-day 1st Publication Public Review from August 17 to October 1, 2018: Addendum 135-2016br; Addendum 135-2016bt; and Addendum 135-2016bu. New Errata Summary Available! (7/18) Atlanta, GA. OK, nobody is perfect. Errata, Latin for "errors", occasionally creep into technical documents - and BACnet is no exception. To make sure you are looking at the correct language in the standard, please visit our Errata page. And, of course, if you find a previously undetected error in the standard, please let us know! BACnet/SC Whitepaper Available! (7/18) Atlanta, GA. Two of the SSPC's top concerns for the last several years have been network security and "IT friendliness." Recognizing these concerns, the IT-WG has developed a new proposal centered on secure communications exclusively using accepted IT best practices. The new technology is called “BACnet Secure Connect (BACnet/SC)” and is the subject of this whitepaper. Simply put, BACnet/SC provides the means to create secure communications connections between BA devices both across the cloud, and within facilities. BACnet/SC uses the latest techniques for security and integrates easily with IT infrastructure. At the same time, BACnet/SC preserves 100% of the capabilities of, and is backward-compatible with, all existing BACnet deployments and devices. The whitepaper is available for download from our Bibliography page and the current public review version of the addendum can be downloaded here! SSPC 135 Installs New Officers! (6/18) Houston, TX. Gathering for a ceremonial photo are the new officers of the BACnet committee. From left to right: Scott Ziegenfus, Secretary (Hubbell Lighting); Michael Osborne, Chair (Reliable); and Coleman Brumley, Vice Chair (Setra). Good luck, gentlemen, and thanks for stepping up! The SSPC also would like to express its thanks and appreciation to outgoing chair, Bernhard Isler (Siemans), for his tireless efforts over the last several years. In spite of living in Switzerland, Bernhard has never missed a meeting and now has more frequent flyer miles than just about anyone. Thanks, Bernhard! SSPC 135 Changes the Guard! (6/18) Houston, TX. Among the highlights of the Houston meeting was the "changing of the guard" of SSPC 135's officers. Here current committee chair Bernhard Isler (Siemens) passes the gavel to incoming chair Michael Osborne (Reliable). Standing together are all living chairs of the BACnet committee except for Carl Neilson (Delta) who was unable to attend. 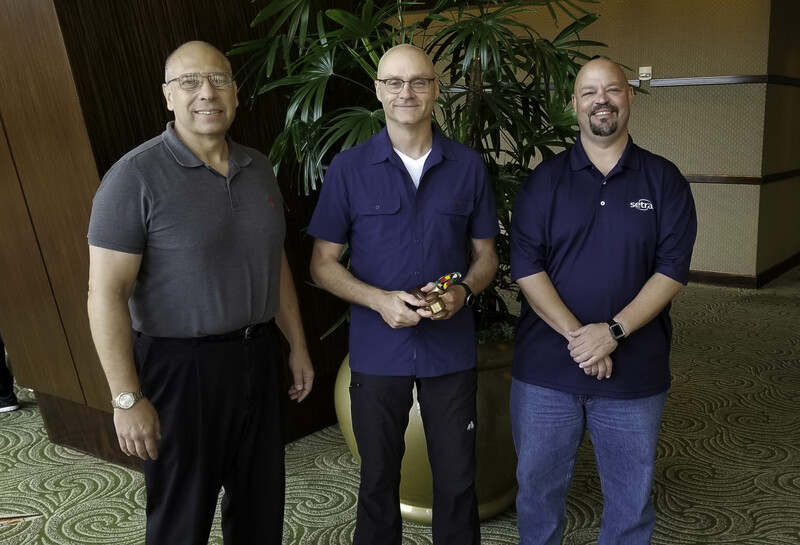 From left to right, Mike Newman (Cornell), Dave Robin (ALC), Osborne, Isler, and Steve Bushby (NIST). The seventh chair of the committee, our dear colleague Bill Swan (Alerton), passed away in 2011. BACnet/SC Begins 2nd Public Review! (6/18) Atlanta, GA. ASHRAE has announced a 45-day Publication Public Review of Addendum 135-2016bj from June 1 until July 16, 2018. This addendum introduces a BACnet Secure Connect Datalink Layer Option and a BACnet/SC in the Network Layer Specifications; adds new Annex YY for the BACnet Secure Connect Datalink Layer Option; extends the Network Port Object Type for BACnet/SC; adds and extends ASN.1 Types for BACnet/SC; introduces new Error Codes for BACnet/SC; and defines Interoperability Specification Extensions for BACnet/SC. The addendum originated within the IT-WG as part of what had been referred to as "BACnet/IT", a revised specification for the use of BACnet in a more "IT friendly" manner. Since the addendum concluded its first Advisory Public Review in February 2017, the BACnet/IT discussion has morphed into deliberations on how "secure connections" can be implemented in an IT environment and Addendum 135-2016bj is the result. 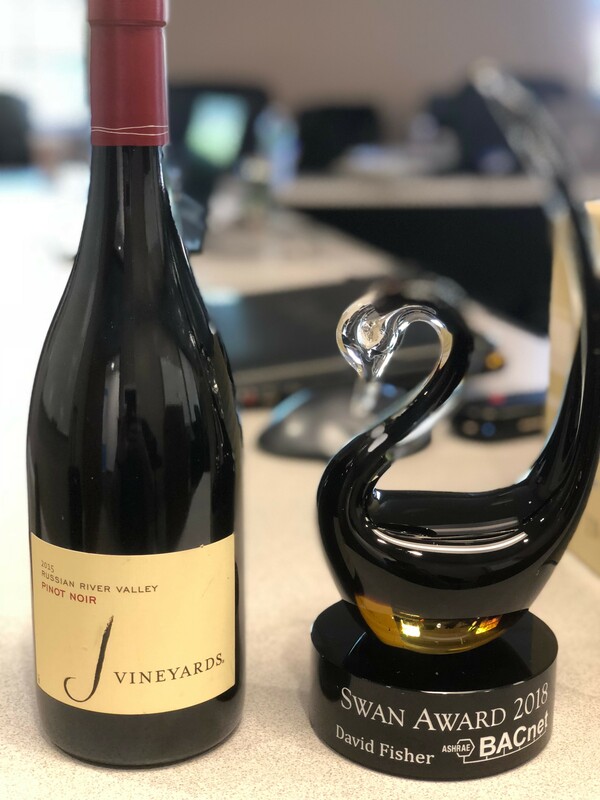 Fisher Receives Swan Award! (4/18) Fort Lauderdale, FL. 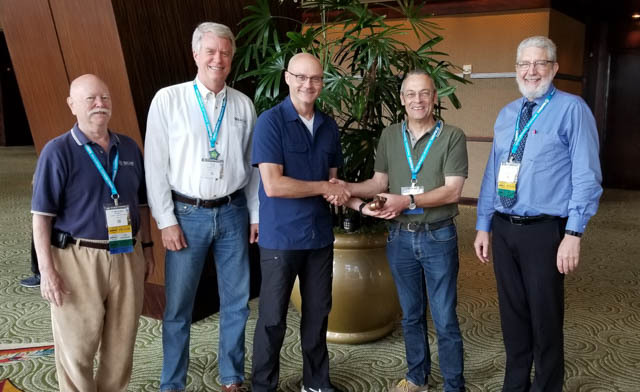 During the April 2018 plenary session of SSPC 135 in Plantation Florida, David M. Fisher, President of PolarSoft Inc. and SSPC participant since 1987, was presented with the 2018 Swan Award. 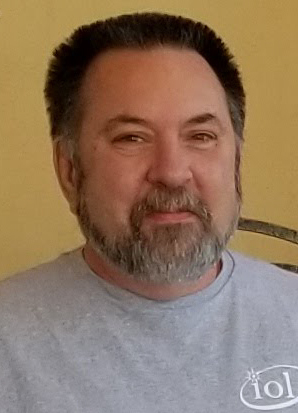 The award can be best described by using David’s own words: "This award, which is presented yearly, honors the memory of our dear friend and colleague, Bill Swan, a.k.a. BACnet Bill, who passed away in 2011. We want to remember him always not only for his substantial dedication and contributions to BACnet, but also as a good and honest man, devoted to his family and faith. This award carries on Bill's example of even-handedness, rational and considerate discussion, and a focus on how to make the standard better for everyone. The award honors those individuals who through their actions demonstrate the qualities of integrity, selflessness, camaraderie and fierce dedication to the standard that we admired in Bill." Dave, by virtue of his tireless efforts to develop and improve the BACnet standard for more than 30 years, truly deserves this recognition. Congratulations, Dave, from the entire BACnet community! Addendum 135-2016br was approved for a 1st Publication Public Review. This addendum contains several miscellaneous changes to BACnet-2016. Addendum 135-2016bt was approved for a 1st Publication Public Review. This addendum contains enhancements for Life Safety and adds support to BACnet-2016 for Occupant Evacuation Operation (OEO) using elevators (lifts). Addendum 135-2016bu was approved for a 1st Publication Public Review. This addendum contains various clarifications to BACnet-2016, including several changes introduced in response to interpretation requests. The IT-WG discussed production of a white paper discussing the BACnet Secure Connect (BACnet/SC) concept as well as scale and testing of BACnet/SC. Collaboration work on “Semantic Tags for Building Data” continues within the AP-WG with groups from outside of the SSPC, including SkyFoundry (Project Haystack) and Brick Schema. Additional use cases for CSML were discussed in the DM-WG including maintenance of public facing XML, JSON, and ASN.1 files. Two Interpretation Requests dealing with BIBBs and Device Profiles were approved. The TI-WG discussed various test changes, including Access Control object tests, BACnet/IPv6 and BACnet/IPv6 Network Port Object tests. The SG-WG discussed how to narrow their scope so that not all of the Facility Smart Grid Information Model (ASHRAE Standard 201-2016, FSGIM) is required. The PS-WG discussed the introduction of an MS/TP autobaud algorithm and the new concept of a BACnet Device Address Proxy. As always, SSPC 135 wishes to thank all of our volunteers for their time and continued contributions. A special Thank You goes to Lutron for graciously hosting the committee for the week long meeting! 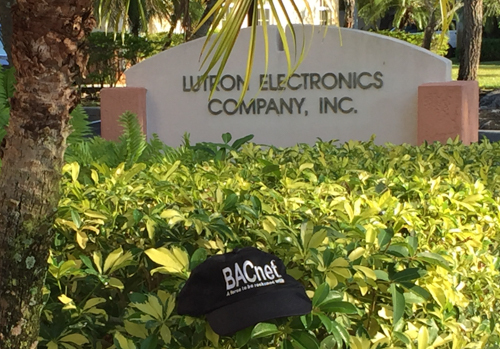 BACnet® is a registered trademark of American Society of Heating, Refrigerating and Air-Conditioning Engineers (ASHRAE). For more information see the notice. This web site is hosted by the BACnet Advocacy Group, you can find us Google+.